Finding the right white for an exterior project contains all the pitfalls that are there when selecting whites for an interior scheme, and more! However there are rules to follow and I have some great tips to help you to select a colour scheme for your white exterior project that you will love. This pretty cottage has Dulux Antique White USA on the walls, which looks lovely as it is in shadow and you can really see the creamy underlying colour. The trim in Dulux Vivid White, which is in the direct sunlight and offers a nice contrast. Do not underestimate the impact that natural sunlight will have on a white exterior scheme. This changes significantly around the world as the natural light in England is very different to the strong unforgiving sunlight of Australia. The intensity of the sun will vary throughout the country too and will have a greater impact in a rural environment, particularly in the outback, than in a leafy Melbourne suburb. So the point that I really want you to take away from this is that colours will vary depending upon where you are, so a white that works well in one environment cannot necessarily be used for another. It is also good to remember that some whites will be in shadow, particularly if you have a cottage style home with a wraparound verandah, while the trim may be in the direct sunlight. There is therefore no point viewing two white samples next to each other inside. Here you may see a contrast and think that this will be exactly the effect that you want to achieve. You must view both samples outside and consider whether one will be in sun and the other in shade. Do not under-estimate the impact that sunlight will have on the exterior paints that you select. I have talked about this in my interior post on whites and it is just as important when looking for an exterior white. Cool whites will have a blue or black base that makes them very crisp but also in the sunlight can make them very bright. Warm whites have a creamy yellow or warm pink base and are effective to partner with other warm colours or for a soft country look. My favourite whites for exteriors though are the ones that have a green base. These are the most neutral and I find just work really well for an exterior scheme. They are very forgiving and won’t land you in trouble like a very blue or yellow white can. The base colour of a white sample is easier to see if you hold it against a sheet of white paper. Large samples of each exterior white that you are interested in should be looked at side by side against a pure white background and you will begin to see that all important underlying colour. Resene Merino is a great exterior white as it is a little dirty but you can see on this house that it looks like a very fresh clean white. If you view it against other Resene white samples, you may think it would be too dark but once outside, it is perfect. 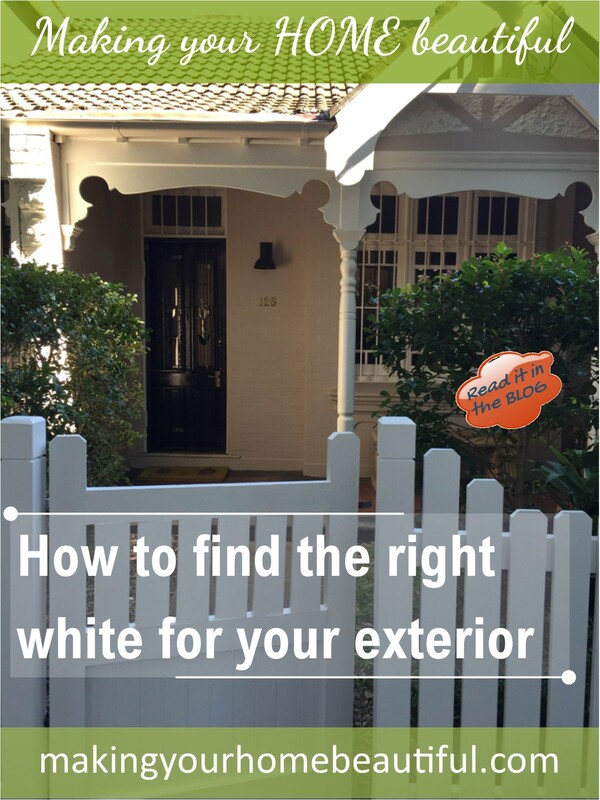 Remember not to go too white for exterior weatherboards as they will soon get dirty! After the location of your property, the next most important point to remember with exterior colours, is that the natural bulk and shadow of the building, together with the intensity of the sunlight, will mean that you need a large gap between the colours to see a difference. I know I am repeating myself, but DO NOT LOOK AT YOUR COLOUR SAMPLES INSIDE! This may sound like the most obvious statement that you will hear but I see it all the time. People will put together a colour scheme at the kitchen table and not take into account the effect of daylight. Therefore two whites that look great together inside, will just look exactly the same outside and the lovely fresh white trim that you thought you would have is actually the same as the wall colour. This house below demonstrates how the natural bulk and shadow will impact on a house exterior with one wall in shadow appearing much darker than the one in sunlight. So if you do like the idea of white on white then ideally you should have a quarter strength of the white for the trim and a double strength of the white for the main colour. If you don’t want to see any difference between your trim and wall colour then I recommend opting for a darker white that will be more serviceable and using this for the trim and wall colour. Basically, you either need a large difference in tone or none at all – in between will just look like you didn’t colour match correctly. Windows, roofing, gutters and fascia, particularly for new houses, will often be in a powder-coated finish which means your selection of whites is quite limited. Remember that if you don’t want to see a difference between your trim and wall colour then it is a good idea to match your wall colour to your powder-coated, Colorbond, or other steel colour so that you get the continuity of your white. Colorbond Surfmist is a popular roofing, window and trim colour in Australia and when you look at this sample next to most white paints, it is actually quite grey and dark. This is good as it will stand up to bright sunlight well but if partnered with another white, it can end up looking grubby and in some lights a little creamy. On the house below I have used Colorbond Surfmist for the garage door and weatherboards to ensure that the whites used on the front elevation are exactly the same. You will see that they both look to be a lovely crisp, fresh white but Colorbond Surfmist is actually much darker than most whites in a colour chart. 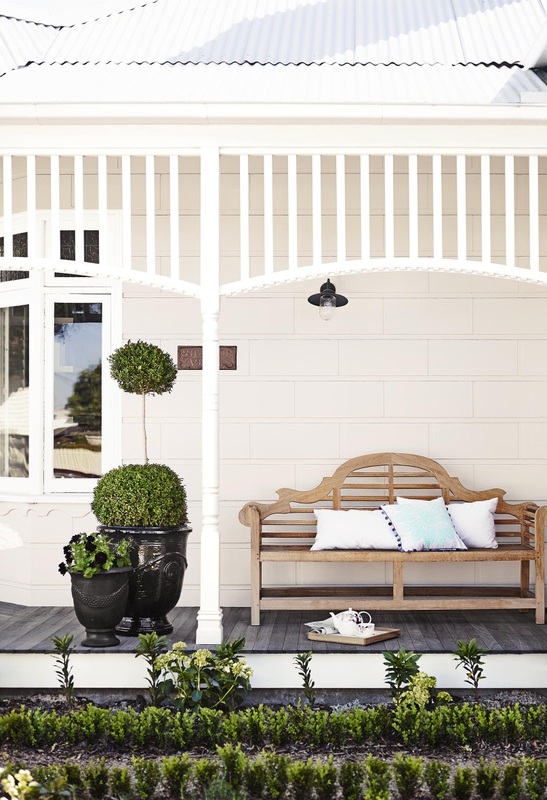 For a cottage style house, it is nice to see some variation between the weatherboards and the windows and this image below with Taubmans Brilliant White fascia, eaves and windows partnered with Taubmans Windswept Beach for the weatherboards works really well. If you are painting a house in its entirety and simply using a white for your trim you will need to consider what will work with your wall colour, as you would for an interior. You also need to consider the look that you want to achieve. If you like the idea of a really fresh white trim, you can opt for something like Dulux Vivid White. However, if you want something a little more serviceable then I would recommend a softer, dirtier white like Dulux Caspar White. Remember that these two whites together are very different but outside and when partnered with a darker neutral for the walls, you don’t notice the difference, you will just achieve a different effect. One of my favourite trim colours, particularly for older heritage style houses, is Dulux White Duck Quarter strength. This is one of those great whites with a green neutral base and I find it is very user friendly. I have used it on this house below with Dulux Camel Train on the walls and it works perfectly. Colours look twice as dark when you hold them horizontally above you so a white that looks great on your trim can end up being too dark for your exterior ceilings. Therefore if you have a full strength of a white on your trim, it is a good idea to use a half or even a quarter strength of the colour on the eaves. If you are already using a very light white for your trim it is usually safe to continue this on your eaves but do remember that it will appear slightly different. I go into much great detail in this post. I have a free comprehensive exterior checklist for you to download. This will ensure that you don’t forget to consider any areas and will help if you are briefing a builder or painter for your next project. This is with other great e-books in my Free Resource Library – sign up here. I hope that you have found this article useful and remember that you can find lots more inspiration on my Pinterest Board, Neutral Exteriors. I would love to hear from you in the comments section below if you have used white for an exterior project or if you have any questions. Happy Painting! 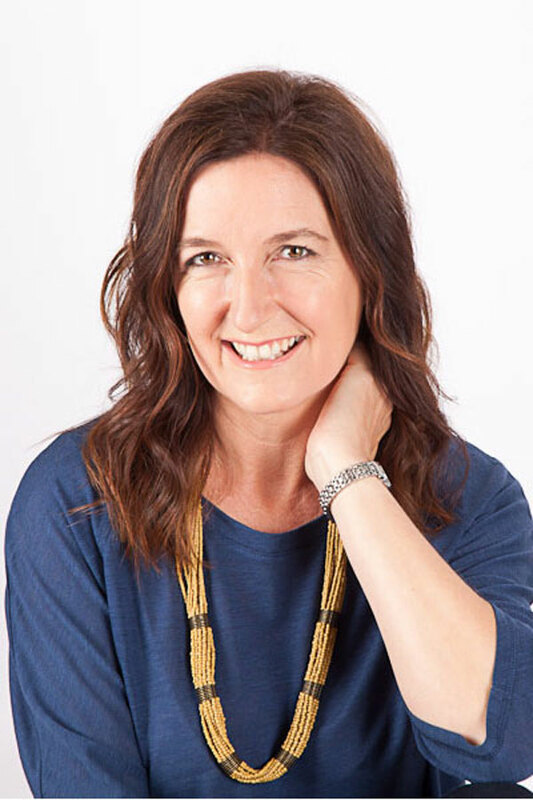 Hi Samantha, I’ve been reading through all your white blog posts, but not quite finding the answer to my question… we have colorbond cream window frames and timber sills/window frames. I am wanting to paint the window sills a white – but am having stacks of trouble finding the right white. I’ve read your posts that suggest using a dirty white (more grey), but I’m not quite sure which colours I should look at… can you help? Hi Rachel Colorbond Cream can be tricky as it is so yellow and you obviously don’t want to match this but you will need a warm white. You haven’t said what colour the walls are but you could look at something like Dulux Hog Bristle which is a good off white with a touch of grey – it won’t match but it does have a warm base so will tie in with the cream without being too yellow. But you really need to consider it all in the context of the rest of the exterior. Always try a sample pot on a piece of card before committing though! Good luck! Ha! We do have hogs bristle half already, but considering changing it to hogs bristle quarter. Any tips on which warm white? We are going to paint the exterior eventually – likely to a grey. We are also going to paint the roof/railings woodland grey. God I hate colorbond cream! This is some really good information about color for the exterior of your roof. I like that you talked about how you should have your trim white. It might be smart to do that because you should make sure that your roof will work well with your home’s paint color. To set the scene: New Build, Scillion Roof, Coastal, just south of Mackay Qld. I do love an all White House, but my dilemma is, will this be grounded enough? Should I pick out the roof gutters and/or facsias with another colour? You have put my mind at rest….The White House it is! I have a 1920s califorian weatherboard bungolow with a teracotta roof. I am thinking of flooded gum for the weatherboards and white for the windows and eaves. But am unsure as to what colour to use for the trims. I like the idea of dark grey with a green undertone what would you suggest. Also the front of the property faces north if flooded gum is going to be too light what darker grey would you suggest and what would be a good white to use on windows and eaves. And then what colour would look great on the picket fence.thanking you regards michele. Hi, my roof, guttering and fascia are shale grey. I am going to paint my exterior in grey and white. I am in coast NSW. Can you suggest a white for me to use? My windows are white too. Thanks for the excellent post. I’d love your thoughts. I’ve decided on Dulux Mangaweka for my newly rendered house. I am going to sample vivid white and white duck quarter strength. Does that sounds right? Any further suggestions to try? Am I correct in thinking I need a green toned white to match the green toned greige of Mangaweka? Sorry. I didn’t say that the whites are for my window trim!! Hi Natalie Thanks for your kind words – I am glad you enjoyed the post. 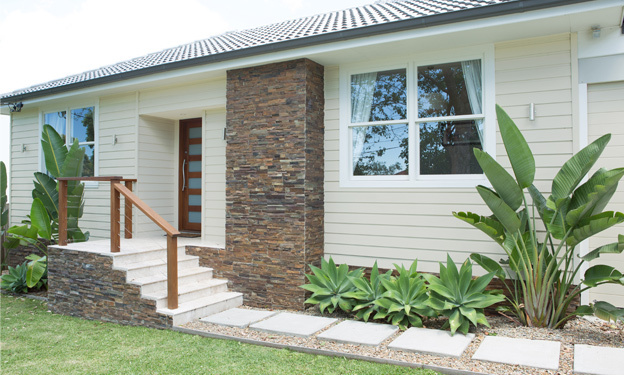 I love Dulux Mangaweka – it is a great neutral for exteriors and although a greige it leans towards being warm. When considering your trim colour you need to think about how much contrast you want to see and also what your gutters and fascias are too and any other trim elements on the house. Also consider the window frames. Are they timber that can be painted too or are they powdercoated? I particularly like Dulux Grave Couloir Double with Mangaweka – at first look it is very grey, particularly if you view it inside but once the sun hits it this gets knocked out and it is a great exterior white. It just depends on the tonal variation you want – you might need to paint a couple of boards and look at it with a large sample of Mangaweka. I can’t stress enough to look at all of this outside at your house in all different lights. I hope you love the end result! We are building a new sycon weatherboard coastal Hamptons style beach house. We are painting the weathboards surfmist, but really need your help on the correct crisp white colour for the window trim. Inside throughout the whole house what interior white do you suggest for our ship lap walls? Thanks, I really need your help there are so many whites I’m so confused. Hi Jeannie Your new house sounds lovely. A good trim colour to go with Colorbond Surfmist is Dulux Lexicon Quarter – nice and bright and crisp so you will see a difference between the two which is important as once you are outside the whites all get washed out. For your interior there are so many possibilities that I couldn’t say for definite which white you should use. You need to consider your flooring – light or dark and the warmth – are you using grey tones or warmer creamy tones in your flooring? The aspect of the house, the amount of natural light you receive in each room, the kitchen colour and benchtop that you want to use. 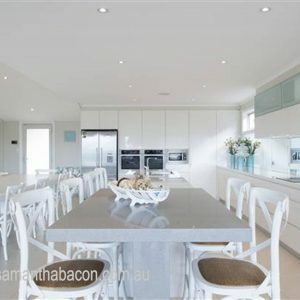 My advice is to choose your floor, then your kitchen joinery and benchtop and then when you have samples of all together it will be easier for you to select the right white. Good luck! We’re going to paint our weather boards in Dulux Oyster Linen and I was wondering if you could recommend a white for the gutters, trim and windows? Someone suggested Dulux Vivid White, however we would love to hear your thoughts on colour match. The house front has a northerly aspect. Thank you so much for your suggestions ! I’ve now put a sample of white duck quarter and vivid white outside against the oyster linen. They both look lovely and as you said just a matter of how much contrast we like. We have three weeks until the painter arrives so still some time re final decision. I’m also contemplating doing the gutters in oyster linen rather than white, with the fascia, eaves, boards and all trim in either white duck quarter or vivid white. Do you have any thoughts on that idea ? Hi Amanda I think that gutters in Oyster Linen is a good idea – these do tend to get grubby and are hard to wash down and keep clean so the darker colour will hold up better and then everything else in the either White Duck Quarter or Vivid White – whichever you decide on. Good luck! Thank you again – I painted a sample section of Oyster Linen on the gutter and everyone loved it ! So…with your skilful suggestions the house and gutters will be Oyster Linen, all trim , fascia and boards in White Duck quarter :-). I would love to hear your ideas on a colour to paint the soffit and also a front door colour ? At the moment the door is white and I think a little boring ( the door is heritage style with two sections of clear stained glass in the top half ). We are building a new house on the Sunshine Coast Queensland. It will be both rendered brick and weather boards. We don’t want a totally stark white house but are wanting basically white tones. We have chosen Colourbond Surf mistake for the roof and garage doors. We have Bradman aluminium windows and doors in white. We are wanting to paint the eaves with exposed timber finials in a bright white and are wanting to paint the exterior walls in a white hew. I think we are trying to find something between the bright white of the windows and eaves and the Surfmist. Any ideas would be greatly appreciated. Thanks – Greg. Samantha, hi from the Sunshine Coast Queensland. We are building a new house and are looking for white and grey paint tones. The roof, facial and gutters will all be Colourbond Shale Grey. The garage doors, of which there is 2 double doors visible from the street, aluminium windows and doors will all be in Surfmist. We saw a Dulux brochure with a Weatherford cottage in Terrace white on the front cover. We quite like the look of this but wonder how it looks in the real world. We are having both weatherboards and rendered brick walls and the eaves will have exposed timber outriggers and are looking for white recommendations. Most of the house is single storey but we are having an entrance atrium which is about 5m high at eaves and the back of the house is 2 storeys but only the roof line is visible from the street. The front door facing the street is due west. Your advice to help in selecting the right colour samples would be greatly appreciated. Hi Greg – just replied to your later email with the Shale Grey roof! I think you are on the right track with the slightly darker roof and if you do want basically white tones then Terrace White may work for you – hope this makes sense! Hi Samantha, in a huge dilemma! Painting my victorian cottage Dulux Beige Bravado, Black front door, gutters, flashing then I want to paint the trims in white as well as the finial and barge boards. I had chosen Casper white quarter but am concerned that it’s a bit of a dirty white, I think I need a creamier warm white? We are East facing. Any suggestions? Painting this weekend! Hi Karen Caspar White quarter will not look dirty outside in the sunlight – it will just look like a fresh white. However with a beige wall you may be better off with a creamier white and you could look at something like Dulux Whisper White which is still fresh with a touch of grey but a little more warmth. Perhaps try a sample pot of that against the weatherboards before you commit this weekend. Happy Painting! 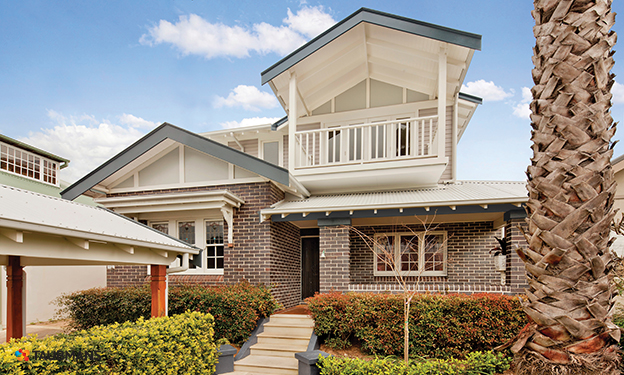 Really enjoyed reading your words of wisdom regarding white exterior colour choices! Vivid white is the colour that was suggested for the pickets to match the posts. I’m thinking of using two different white tones on the pickets/posts. What colour would you suggest will be ideal for the pickets?? So greatfull for your help! Thank you so so very much for your advice and help on this! You explained it perfectly. My home is a red clinker brick , more of a traditional style home with white color bond gutters and vivid white window trims. I’m afraid if I paint everything the one colour, all the detailing will be lost and just be one giant bright white blur! I’m leaning towards a softer white tone, for the pickets only because I’m afraid that the same tone of vivid white across the whole fence will perhaps look one dimensional. I have a house with Primrose window frames and a Classic Cream garage door. I am about to extend the house and may need to render if the new bricks look too out of place. I am wanting a pale cream or creamy white that will tie in with the colours already there. I prefer Dulux colours. Have you any thoughts on this combination or some other suggestions? Not too sure if the “blue” is what I want. Have you any other choices that may suit instead of the Miller Mood. We were very happy to have Tranquil Retreat , but unfortunately the Council requires an LRV under 40. Tranquil Retreat exceeds this (LRV49). We will still submit Tranquil Grey but are looking for a “fall back” in case we cant get it through. It’s amazing how confusing white can be! What is your thoughts on whisper white? Hope you can help. Repainting a rendered house We have recently purchased that is approx 20 years old. (not sure of the existing colour). The window, gutter and facia colour is White Birch, front door is a very dark charcoal navy. The effect is monochromatic, which I quite like for the house style. Can’t change the windows- maybe can change the gutter and facia. The windows are not amazing- so don’t wish to make them a major feature of them. They are commercial profile, so are thick aluminium. Grey slate tile roof, modern French provincial style. The render needs a paint. The existing colour throws a creamy yellow. I have been following your blog and hope you can assist with colour selection. Considering White Duck or Beige Royal – not sure what strength. Am I on the right track or can you suggest another colour. I read through your articles and comments, and have decided on Dulux Whisper White for my exterior weatherboards. Thanks for your help so far! ‘White on White’ was a must as per my local heritage design guidelines. Just want to make sure Lexicon Quarter trims will work with whisper white? I will be relying on mature landscaping, limestone retaining, an exposed aggregate driveway, and zincalume roofing with half round guttering to help provide the necessary colour contrasts. I am trying to go for a more contemporary Australian Coastal Style and avoid the more traditional old-fashioned cream heritage hues. Hi Sam. Council is asking me to lock in my colours in order to get planning approval. Hoping you can provide your thoughts? Thanks! Hi Andy the advice I gave is as much as I can do in this type of forum – it really is a case of you trying the colours on your house to see if you think the contrast is enough – it will be very close but will rely on the amount of light and the aspect of your house. We are building a country style weatherboard home with a large varrandah out the front. There has been a mistake with the roof and facia colours ordered and now the builders are offering a great discount if we take the colours that have been ordered. So we now have Colorbond shale grey roof, Basalt fascia and Pearl white windows I’m stuck on what colours to choose for the external walls and also what colour to do the poles on the varrandah which there are 7 off. I did want the windows and poles to be a feature. Do I have to keep the poles the same as the fascia? I was hoping for off white to match the windows. Hi Samantha, we are building a house and I am really struggling with finalising our exterior colours. 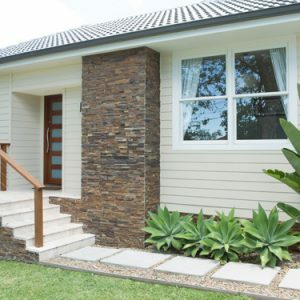 It is a single storey, north facing rendered house with a weatherboard feature to the bedroom window side and a large porch which means this component will generally always be in the shade. I am set on a grey/white theme & I am thinking about Dulux Stepney for the boards and render, maybe Vivid White for the trims, posts, fascias and garage door and the hardest part, the roof, I’m tossing up between Basalt & Monument. I’m worried Basalt might no offer enough contrast to the Stepney and Monument might be too dark? Hoping you can provide your thoughts! Much appreciated. Great article – and great to read the comments too. Inside we were thinking about Pale Tendril with Vivid White trims – but are now worried it might be a bit minty. Our original thought was to continue with the green theme, and that it would look nice against our dark carpet and vinyl plank floor. Failing that – maybe just a fairly warm grey like Pipe Clay half or something. Thank you for all your wonderful expert advice! I stumbled across your post after many months of deliberations and had all but given up on finding an exterior colour for my house! Colours we test are mostly turning pink or blue (eg Dune, Powered Rock) or sometimes green (White Duck). I have a 1940’s south facing Bungalow in Perth with varigated red/plum/bluish terracotta tiles. The front has very textured render (upper half) and varigated maroonish red/blue bricks (lower half). The rest of the house is red brick. Front door is Monument. The gutters, timber gable trims and windows are painted Surfmist. A Designer suggested we paint the front rendered walls and rendered fence either: 1) Dulux Pebble Grey or Ghosting 2) Wattyl Ice Volcano or Dulux Light Rice. Apologies for the long question. Many thanks for your advice. Thank you so much for your advice Samantha!! You are spot on! The front is busy and “heavy” looking. I forgot to mention we also have a large format, mid-grey, rectangular paver laid brick bond on the front drive and footpath. This also adds to the heaviness. Thankfully we have a massive white frangipani and grass which helps soften things. I will try Ghosting as you suggested. I had thought of using Surfmist if I couldn’t find anything else, but DH wasn’t convinced – so thank you for your reassurance re this option! If I did want to try a colour with a bit more depth is there anything you would suggest? Many thanks for your advice! Hi Lily If you like Ghosting but want more depth you could try Powered Rock or Paving Stone. Good luck! Thank you so much for all your advice! I’ve painted sample of all the colours you suggested and they all work really well with surfmist. I appreciate your help with a decision I’ve agonised over. Many thanks again, Lily. I stumbled across your blog looking for some advice on matching a white powder coat colour to Vivid White. Some very interesting colour schemes going on in these comments! 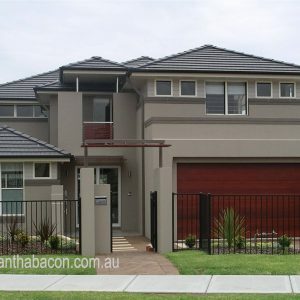 We have a beautiful Queenslander which has very fancy wrought iron gates in Monument and lovely black and white checkered tiles on our front porch. There is a lot of character with these elements so we wanted to add some contemporary using the white on white scheme and are using Snowy Mountains Half on the main exterior walls and fencing with Vivid White as the accent colour. Currently I am trying to figure out the best powder coat colour for my garage door to match with Vivid White preferably. Do you have any suggestions? Thank you Samantha, much appreciated. colour bond Surfmist, Dune or other? house with white window frames is too much same colour? Hi Samantha, thank you for your article and detailed replies to everyone. We are finalising exterior colours for our farm house. I have shale grey on the roof, gutters, fascia and garage door. I have white aluminum windows that I will paint a white trim around. And we have merbau deck. I need a light grey for the weatherboard and would like a dark grey for the base boards. For the light grey I have tried surfmist which is too yellow for me and snow season (which i really like) but it is too blue against the garage door. The garage door faces south. I am quite keen on terrace white but fear it is too white. The paint shop has also suggested NZ dulux lyttelton quarter because it has the same mix of colours as shale grey. Can you suggest something that is not “white” grey but light grey that will go with the shale grey? For the base boards I an quite keen on Basalt or Dulux Malay Grey but I habe stopped thinks about them until I can pick a light grey. I am about 20 sample pots in and desperate!!! I like white for exterior, so these tips are helpful. Thanks for your article! This is a little off track as I’m finding it hard to get advice anywhere. We about to move in to a house that has a surfmist ritek (now called something else) sandwich roof, so roof and ceiling are Surfmist. So we are stuck with the surfmist ceiling. This presents a challenge as we want to paint the interior walls white. They are currenty grey and clash with the surfmist, The surfmist ceiling can look yellowish against the grey. I discovered when going to get a surfmist sample pot that it has black, red ochre and yellow ochre tint. House is very bright, eco style, north facing, will high ceilings (almost double height at some points, and clerestory windows. I’m thinking to paint some walls surfmist and others half surfmist, however is there any other white which will compliment it without making it look too dark and grubby? I’m really enjoying reading your blogs and especially all your tips for working with whites! We are painting the exterior of our rendered Californian bungalow (front facade is North facing) and want to go with a charcoal and white on white scheme. It’s been suggested we use Dulux Domino for the verandah columns, window trims, gutters and front door, Dulux Lexicon on the walls and Dulux Vivid White for the windows and gable trims, but after testing them outside I can’t see any contrast between the two whites. I want to keep the Vivid White but could you recommend a second white that will compliment Domino and contrast enough with Vivid? Do you offer consultancy services? We are finding it difficult to decide on the right exterior scheme for our house and could use some professional input. Hi Samantha we are thinking of painting our beach house Vintage Beige. It has a very faded Eucalypt green colorbond roof. We are thinking of painting the windows and doors vivid white. could you please advise if these colours go together or should we try other colours that will go with the green roof. 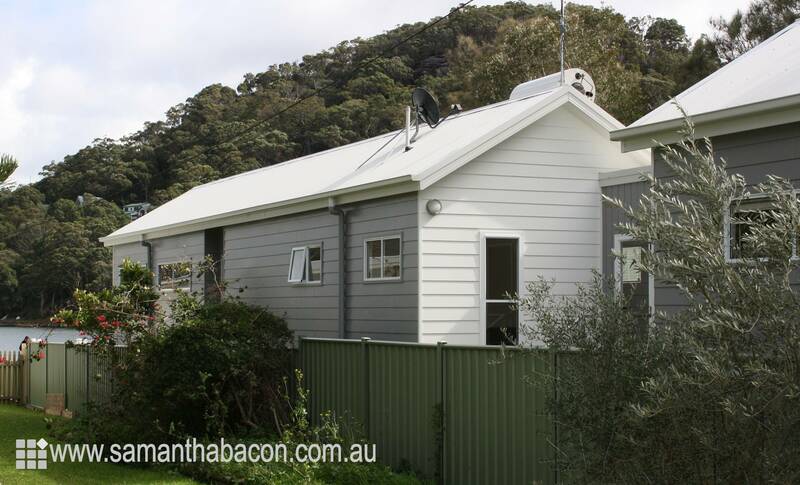 We have a westerly facing California bungalow with a Colorbond roof in Headland (or it could be a faded Manor Red). The weatherboards are currently in Portland Stone with Seed Pearl trim and Bogart fascia. I’ve always found these colours way too mute, heavy and not very welcoming. I was thinking of painting the weatherboards in Dulux Candlebark, with Namadji on the fascia and gutters, and Natural White trims. Would this combination work or could you suggest a scheme that would complement the red roof and freshen the look of the house. Am excited to have found your blog and your helpful tips and inspiration pictures. My husband and I have been renovating our home. When we bought it, it had a country style feel with a beautiful high roof in our open planned kitchen and lounge, however we have renovated it to more of a modern/scandy feel with white (lexicon half) and grey (deiskau) walls. Our exterior is currently yellow weatherboard with green trim and gutters. The creamy yellowy roof you don’t really see as the house is on the side of a hill. The windows have cream trim but then the wooden louvers below them have boxed out screens that are browny/black. My husband has recently painted over the deck tiles with a charcoal grey and paved the front and side with grey pavers and rocks. Would love to hear of you have any advice for us. Hi Samantha! Love your blog and you have provided so much inspo for this first time home maker. We have just finished building our dream home in Mudgee NSW and I am really struggling with finding exterior colour for the cladding. We have monument black gutters and monument black front and laundry doors. Huge big wrap around verandah which throws shade. Our style is country style meets hamptons. Our window trim is lexicon quater but I can’t for the life of me find a white for the exterior walls. I basically want a really clean crisp white alongside the lexicon quater window trims and to go nicely with the black doors and gutters. I don’t want much contrast and want it to look like a clean White House with black accents. Can you recommend a good white for the walls to go with lexicon quater and monument black. Also what would I paint the verandah railings? Same as the walls? Sorry for the essay and any advice would be greatly appreciated. Samantha thank you so much! I will go and get samples of your suggestions today. In your option do you think all white cladded houses work with black trim? I feel like it could look really classic and smart or be a massive failure and just be too white and bland? Otherwise I was thinking of doing the monument black, lexicon quater and instead of another white I was going to use a grey – tranquil retreat. There is just so much to be painted outside I don’t want to get it wrong! Thank you Samantha I really appreciate all your advice! Thank you very much Samantha! Really appreciate your time and help! Thank you so much for your reply. I would love any recommendations for any warm neutral you could suggest and I will pick up a sample of the humble fawn today too! I made the mistake of painting the fence in white beach quarter and it just looks white in the sun and clashes terribly with the cream. At least I only did the fence first and not the whole front of the house. I appreciate your help so much. Oh I did meant to ask your opinion too about whether it’s a good idea to avoid the yellows and go for a more neutral colour or would you go for a cream? Thank you so much for your suggestions Samantha. I did try the Humble Fawn and it is a really lovely colour but I feel that it makes the colourbond cream shutters look even more yellow. I am really struggling to find something that works. I don’t know that I have explained it particularly well either. We have classic cream colour shutters and a monument coloured roof and gutters and two quite large areas of sandstone. I was looking for something a bit lighter to lift the whole look and I did mention avoiding yellow but I am now thinking that it really is going to need to have some yellow in it otherwise it is just not going to work. I was wondering if you think Crewelwork or Stowe white may work. I did wonder about Chalk USA but am worried that may be too yellow. I appreciate your advice enormously. Thank you so much once again. You were spot on Samantha. I went ahead despite my concerns and the Humble Fawn looks great. Thank you!! Would you suggest doing the window sills and surrounds and decorative features in monument or half strength Humble Fawn? Now that the wall colour is looking so good I want to make sure I get the rest right!! Wow, have just spent a while reading a lot of your posts/responses. I’d love to hear from you with my paint challenge…. We have a semi-detached rendered brick cottage and for our exterior, we’ve chosen Powered Rock for the walls with a Black Caviar front door (I’ve seen Dulux TeaHouse too with Powered Rock, so not sure what would be better). Fence, fascias, windows trims in white…..either Snowy Mountains Half or Caspar White half (which one? )I had Vivid White initially but it may be too stark? We’re South facing at the front. The semi is 2 storeys and has 3 strips of horizontal guttering (level 1 roof, ground roof, front of bullnose awning) and fascia at the front. The roof is Colourbond surfmist. We had a designer suggest painting the gutters in the Black Cav to match the front door as it would give some definition to what would otherwise blend into the grey surfmist roof and potentially be a bit bland. The fascias under the gutters would be white. Keen to hear what you think about the dark gutters as it will totally change the look and the door won’t be the isolated ‘pop’ of Black Caviar or Teahouse. Alternatively, we would paint the gutters the same as the wall colour or white? For our interior, I’m struggling with our warm toned brush box timber floors (throws honey yellows, rich brown reds, oranges). I tried Silver Tea Set but it’s looking a bit lilac at times in north light and rather flat in the south facing rooms. Not sure to go more blue undertone like Tranquil Retreat half or something like Brume half. I’m prepared to do the south facing rooms in a stronger strength than the rest of the house. I love Half White Duck as a colour (love hint of green for the peacefulness) but it may look too yellow green with the warmth the floor is throwing. It is one of my fave colours along with Resene Sea Fog. Hi Leanne glad you love the blog! Casper White quarter is very white inside, let along outside in the sunlight and you at least need full strength, which will still appear just white, even in the softer Tassie light. This could work with Vivid White as the trim but it will depend on the amount of light that you receive so test it out first. I think either Ironstone or the Vivid White for your fascia to keep it simple. Good luck! Thank you for your help. I took your advice and looks great! Hi Samantha, I was wondering if you could help me..We have a Californian bungalow that has a reddish tiled roof and manor red guttering and I want to paint the exterior white…the lower half of the house has been clad in rocks…Can you offer any suggestions? 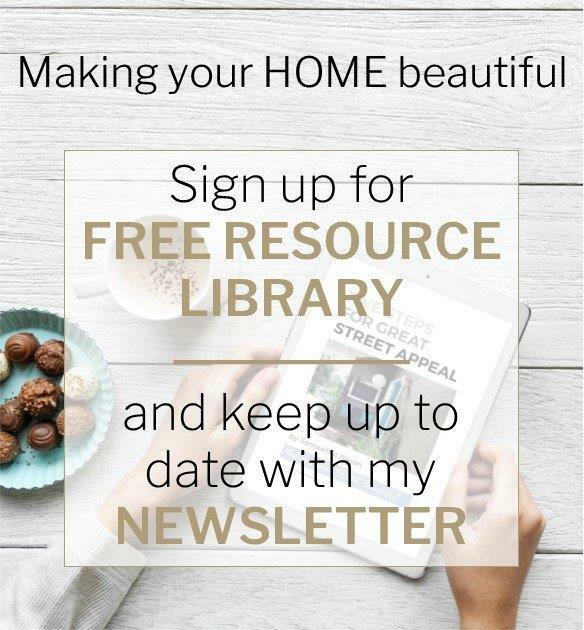 your blog is wonderful and very timely as I need your expert advice on choosing colours for my mum’s fairly plain little weatherboard which we will be painting in a couple of weeks. The fence which is Paperbark colourbond and the front door which is Resene Red Berry are the two colours that we need to work with. We are thinking of staining the front porch and courtyard decking Black Japan to tie in with the Japanese style little pebble garden near the front porch and mum would like to keep the windows a white colour. The roof tiles are a dark brownish grey. We have tried Stone Cave and Winter Grey on the walls but found both looked very washed out in the bright sun so I’m wondering if a darker brownish grey colour would work better on the walls and maybe a dark charcoal or black like Monument or Black Felt on the gutters, although my Mum is not keen on anything that looks too grey. I really want her to be happy with the colours but am struggling to know what would look best so I am hoping you can work your magic and be able to provide some suggestions for the walls, eaves, gutters and shade of white for the windows. we’ll try out samples of these colours. Thank you for your time with this blog and all the suggestions . Could you please offer some advice for the exterior of my house? It is an old rendered west facing house (in WA) with a pale eucalypt colorbond roof and guttering which I will not be painting. What do I paint it to match that roof? I do not like cream/yellow. Wow I have learnt so much from reading all of these comments and your responses. We are renovating a 1970’s red brick home. The tiled roof has been painted in colourbond match monument and the gutters are also monument. The facscia and powder coated windows are colourbond surfmist. The front of the house is south facing with no direct sunlight so quite heavy shade. The surfmist has always looked white to me. We installed some timber French doors and with the bright white undercoat i could really see the difference and how grey surfmist is.
. Im thinking we will have to continue surf mist as the white and paint the French doors and entry door in this to match the front windows and fascia. I’m just stuck on the main house colour. Something dark enough to contrast and the surfmist still looks white but also light enough that it doesn’t look too heavy in the shade. I’m open to any neutral colors that will work though prefer warm grays or greige. Hi Renee You are on the money with painting your French doors and front door in Surfmist – it will all just look white then. With this simple colour palette you are lucky that you have so many options. I really like Dulux Whakarewarea Half strength at the moment. It is a greige which has warmth and is a classic neutral that will give you longevity. A nice contrast to the Surfmist without being too heavy. Try a sample though as it may not be grey enough for you. Good luck! Any advice is helpful at this stage! I will test a sample pot so I can try in on the front in the shade and the back in the sunlight. Can I also ask, its better to go a shade lighter under the eaves too isn’t it? would it bet better to go half or quarter strength surfmist or any plain white. thank you?! I am struggling with a single level federation “terrace” with a red tile roof and red brick construction. It is a duplex and heritage listed. Present colours for the non brick facade are the traditional cream/green/red. The roof is quite imposing. I would like to lighten the facade and try and move away from the eye catching orange of the tiles while maintaining the heritage aspect. The other duplexes and houses in the street are of various colours but all heritage. Would be grateful for any help you can provide. I need to choose a colour for my rendered two storey home. I have a surfmist roof, gutters, and faciers. My windows are pearl white. I am after a crisp white. I was planning on doing Casper white quarter but feel this may not be white enough? Any recommendations for a bright crisp white. Thanks so much for your honesty. I think I might stay with the Casper white quarter strength then. My house faces east and I am after a very white look but will break it up with plenty of greenery planted at the front (hopefully). I have a lot of large windows on the front facade with three sets of French doors on the the upper level which I am hoping will also break up all the white. The upper level will be be in scyon linea to break up all the render. Reading your various blogs has been wonderful but I think I have stumbled across them a few weeks too late! Painting the exterior of an old weatherboard Queenslander in western Queensland in a rural area. Have chosen Colorbond Paperbark for the walls (we have seriously bad red dirt/dust) and Colorbond Ironstone for the gutters (roof is zinc and won’t be painted). The door, window and trim colour I have started doing Vivid White and it is way too stark. I would like to bring out more of the black in the Paperbark and less of the blue in Ironstone. Do you have any suggestions? I have tried Colorbond Surfmist and Dulux Casper White Half – am now leaning towards the Surfmist????? Would love some advice as the nearest paint shop is 150kms away so sample pots are not easy to come by!!!! Thanks very much for taking the time to respond. Much appreciated. I will give the Surfmist a go. Can you please help with the soffits and ceiling of the alfresco. Roof, guttering and fascia are Surfmist Colourbond, the exterior render is Grand Piano Half and I was looking at either Vivid White or Casper white quarter for the outside ceilings, do you think either of these would look okay or is there a better colour? Hi Samantha, would it work if I used ceiling white with 20% Grand Piano Half or is it best to just stick with Casper White quarter? Hi Samantha, I am building a lowset house in Qld on a narrow block with the front door at the side, not visible from the road. The walls are rendered and I have a double garage door and study at the front with two windows across the study wall. There is a weatherboard feature on the study wall. The roof is angled on the study roof line. I have no idea what to go with on the roof, render or garage door. As you drive up the street you will see the roof. I like surfmist or shale grey for roof and was thinking ironstone windows and garage door. Should I just keep it all surfmist or is it good too have a contrast. Any ideas would be appreciated. Hi Samantha, have read your columns in magazines and appreciate your sensible advice ! What colour trim for gutters, fascia, barge boards and verandah posts goes with an 1970s light peachy/orange brick house ??. The front faces west. 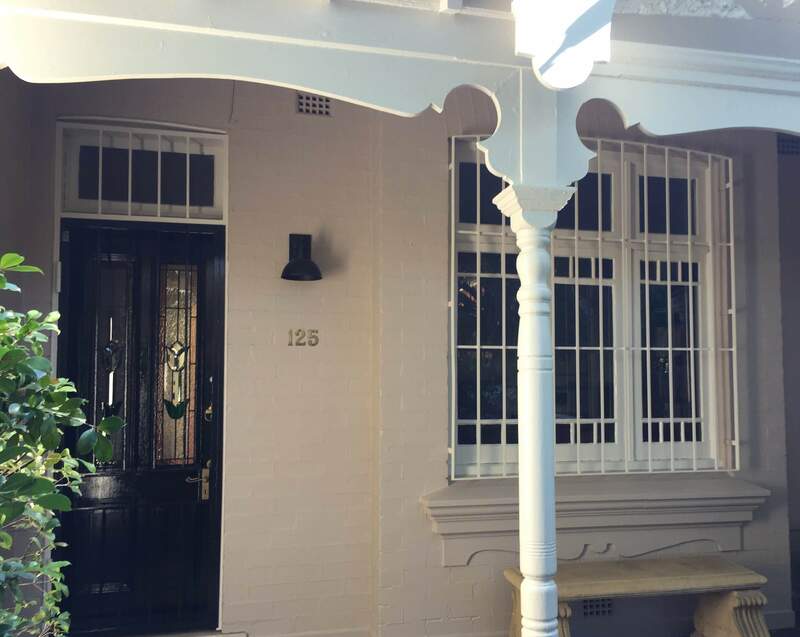 I like white but read somewhere that a “mushroom” colour tones it down, and that is actually the colour of the front screen door ( dulux stone beige) with a pale mushroom/beige on the verandah tiles. Should I go with white with a green undertone, white duck quarter or whisper white, or beige royal quarter or similar? I want to brighten up the exterior but also “ground” the house by having a darker base colour on the foundations. Would a brown be OK ? The windows frames are plain aluminium, and I know it sounds a bit odd colour wise, so hoping you can help, thankyou. Oh thankyou so much Samatha. I had been wondering if I should use the colour of the front door for the trims, but wasn’t sure. After so many sample pots and sleepless nights I finally feel excited to start painting! Thankyou for your wonderful blog, what a great service you provide for us colour challenged ! I’ve enjoyed reading your blog – thanks! I’m struggling with paint colours for a weatherboard second storey addition to our brick house. At this stage we are keeping the bricks as is so I need to take that into consideration, regardless of what we may do in the future. Our bricks are various colours ranging from red/orange to a more grey/brown. We have sandstone garden walls and light (sandstone looking) pavers. Our new roof and gutters will be Windspray. We like the grey/white colour scheme as we live close to the beach and it suits the area and surrounding houses. I have tried various different greys but would love your opinion. We have tried Tranquil Retreat, Milton Moon, Silkwort, White Duck (love this colour but looks dirty and almost yellow against our bricks), Chanson (too blue! ), Spanish Olive (I love this colour but was too green with the bricks). We intend to have the same white on the fascia, eaves, trim and I have tried Vivid White and Lexicon Quarter. We will also be having a garage built and clad the same weatherboard – we would like a wood stain garage door. Thank you in advance! Hi Samantha, I have just been reading your website and I am hoping you can assist me. I have a country style homestead home which is hardiplank (painted a hideous radioactive looking green), Primrose Cream windows, Cottage Green gutters, downpipes and roller doors. We also have a main front door and four french doors. I am desperately wanting to update it but I don’t know where to start. I need to keep the gutters and windows the same colour as I can’t afford to replace/paint them. I have found your blog most informative. Thank you. We are building a country/hamptons style home in the Sunshine Coast Hinterland, frontage will be facing East with deep verandahs on the front and Northern sides. We have chosen Colourbond Ironstone Roof, gutters and facias with Surfmist Garage Doors. The Windows are Dowell Pearl White With a timber trim. The Scyon Linea Boards we were thinking of using surfmist or Greyology 2 and then maybe vivid white or greyology 1 for window trim, verandah post and railings and the underhouse skirting Ironstone. Would love to hear your thoughts. I need to repaint the timber posts around my verandah which are currently a cream colour. No idea what the existing colour is so will need to choose a new colour. The house is a traditional brick home in a country area. The roof is paperbark with a blue gutter and the windows are White Birch. Should I be going for a cream colour to match the windows or go a little bit darker? Trying to avoid any yellow look to the paint. Appreciate any advice you can offer. Thanks Samantha and I appreciate your prompt reply. I went with Grand Piano for the interior of the house and I guess this would also be an option as well. I didn’t want to go to dark outside which may make the window frame colour stand out more than it needs to. We have a small NZ house near the beach with a large deck overlooking the ocean. 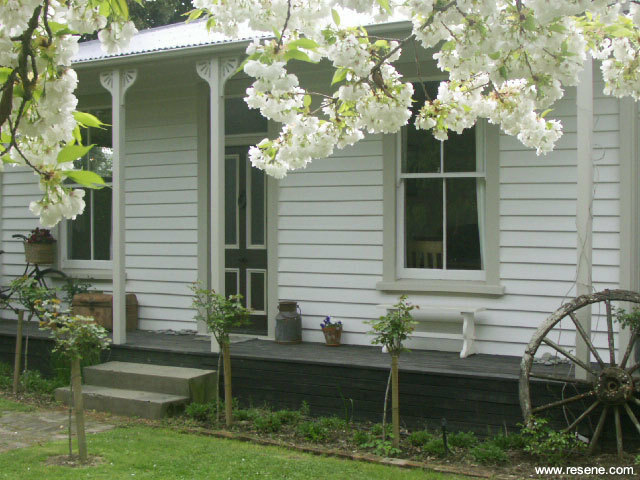 It is a tiny house at the front and we decided to paint everything Dulux Wairakei . ( a little like Natural White) It looks great. We painted the trims the same colour. The roof is a dark grey which is a little heavy but it is new and we can not change it. My question is..what is a good front door colour to go with this? I love black doors, but this is a small seaside house and it may be too heavy with the roof. What are your thoughts? A nice stone, taupe colour? A dark blue? I have read a couple of your posts on exterior whites now, which I’ve really enjoyed, but am still a bit overwhelmed by the choice! We have always wanted a white house. I really don’t like yellowy whites, but I don’t want the house to feel too stark/bright/cold… We have an old California Bungalow with a steel roof. The interior we have done Dulux Snowy Mountains Half with Vivid White trim and I am thinking Whisper White with Vivid White windows and trim for outside. We have big glass sliders across the back wall of the house we are leaving their natural colour and we plan to have a couple of brick pillars with natural timber posts on the front porch. We are east facing, in Melbourne. Your feedback/suggestions would be greatly appreciated! As others have said I am desperate for some advice as my sample pots pile up! We have a 55 year old split level beach house in Victoria, built from AC sheet with wide vertical flat ribs. We face East and the house gets a lot of sunlight, with a deck on the front of the top level. It is currently faded yellowy colour with dark blue trim, very popular 20 years ago! I want to move to grey and white, but not a ‘grey’ house, as many others are. I was leaning to white walls with pale grey window trim and monument spout and fascias. Alternatively quite pale grey walls with white windows. Every grey I try seems either too grey, or starts looking pale blue, which is a definite no. Can you offer me some advice please? I would appreciate any suggestions, and am loving the advice you are giving others. Hi, I have an old Cobb and co homestead that has vivid white window trims and doors and ironstone roof. My exterior walls are classic cream but it looks too yellow, I am wanting to take the walls back to an off white, I tried surf mist which looks ok in the shade but not in full sunlight. What would you suggest, I thought maybe a antique white??? I’m so happy to have found this blog with all your wonderful advice! I’ve found reading all the comments very helpful, but I’m still a little perplexed navigating the whites! We have a 1950’s red brick house with steel casement windows, which I’m currently in the process of restoring, and then painting. They are currently cream, and we’re wanting to go white to really lift the house. Being south facing, I’m thinking Surfmist is going to throw too much grey, so leaning towards Casper White Quarter, Lexicon Half or even Natural white. Gutters will be monument, and fascia/eaves will be white too. Any feedback/recommendations you can give would be so greatly appreciated!! Thank you! I have a fibro Californian bungalow with terracotta roof. As many of the bold colours I’ve seen look out of place with a terracotta roof and gutter colour especially really can make or break the look, I’ve decided it needs to basically be white, so your blog has been really informative. I too am not fond of yellowy whites and tend to favour taupe undertones. The house is in the Blue Mountains and faces west. I’ve been thinking of Dulux Pebble Grey for the walls and Wairakei 1/4 for trims, windows and eaves with Surfmist (or maybe Dune) for the gutters. I’m a bit worried the Pebble Grey might be too strong especially on the south walls and would appreciate your feedback and advice on this combination. Have only just come across your fantastic site. I am having sleepless nights trying to decide on or house exterior colour. I want white but our house faces east and i don’t want our neighbours blinded each morning. We have monument windows and gutters and are using lexicon half and quarter inside. Will i get the white effect i am looking for with surfmist? Or should i go with lexicon half? Also considered white terrace but am so confused. I too love your blog and your great advice and am incredibly impressed with all of your responses. We are building a two storey weatherboard solar passive house near the beach in Perth and are aiming for a coastal look similar to the Byron Bay property picture you used in your post on white trims. What suggestions do you have for colours to achieve this look? Sorry – correction on the windows they are aluminium so will go with pearl white (surfmist is an option though). Wow, I wish I came across this earlier! We’ve almost finished renovating our 1920’s Californian bungalow. We went with Silkwort for the weatherboards, Baltica for the bottom boards and Vivid White for the window trims. Perhaps we would have gone for a slightly less stark white if we’d come across this sooner. The roof is night sky (colourbond). I stumbled across this blog because we are about to get our front fence done. We are going for woven wire and we need to choose a powder coat colour to go with the house. We are thinking a white fence and were going to paint the posts vivid white to match the window trims, and need to work out which powder coat colour to go with for the wire. From reading here it seems like Pearl White is the way to go. Is that right? And should we go for the vivid white on the posts, or would you recommend another colour (remembering that the window trims are already done in vivid white)? Also, is white even the best colour for the fence? Should we go black (to match the roof)? Or is there another colour we should consider? Would love to hear your suggestions! Thanks so much for your reply Samantha. I didn’t mention it in my post, but we actually had originally been thinking Night Sky for the fence, but changed our mind recently to white, so maybe Basalt could be a good compromise, as you’ve said! If we go Basalt for the wire would you recommend painting the posts and balustrades in Baltica, or is there a paint equivalent of Basalt? (I see that Basalt is one of the powder coat options, but I couldn’t find it as a paint colour (sorry if this is a stupid question). We have to decide this week and I am terrible at making decisions! Thanks again! We may have made a decision – but believe it or not it’s not one of the ones I’ve been mentioning!! We drove past a house with a similar colour scheme to ours with a woven wire fence, and we really liked the look, so we knocked on the door and asked what colour their fence was!! Turns out it’s Monument (their house was Surfmist though, so a bit different to our Silkwort). Looking at colour charts, to us Monument looks a bit darker (and less blue) than Basalt but not as dark as Night Sky, and very close to Baltica. So we are now likely to go with this. Please let me know if you think this is a mistake!! Thanks for a super informative post and comments. I’d really love to hear your thoughts and suggestions for our 1960’s single storey house. It is in WA and faces west and has a lot of glass doors/windows with plain white wooden frames on the front elevation. There is also a deep verandah (white slats with clear sheeting) that spans most of the front of the house. The roof is scillion and isn’t visible. We want to paint the exterior to achieve a cool coastal look but our biggest issue is that the house is set behind a 3 metre high retaining wall that is also rendered and will also need to be painted (it spans the whole width of the property). Do we paint the house and retaining wall the same colour? Do you have any suggestions on a white that would suit this situation? I’m having to approach the selection of exterior whites from the perspective of thermal design, cyclone safety, security and availability. In a former existence, a long time ago, I used to be a consulting engineer in commercial building thermal design in the UK. But now I live less than four hundred metres from the beach in the Wet Tropics of Far North Queensland where the thermal gain through the roof under a clear blue sky can be horrendous, but on other days mould, mildew and salt corrosion under a leaden, dripping wet sky creates a totally different effect, both aesthetic and psychological. In major renovations, new garage doors up here must now be cyclone rated. That limits the choice of Colorbond still further. By far the best Colorbond for thermal comfort under the roof under a strong tropical sun directly overhead in a perfect blue sky is Colorbond Coolmax Whitehaven. But no Australian garagedoor makers offer Whitehaven. Most Australian building designers have never heard of Whitehaven because BlueScope Steel currently targets Coolmax Whitehaven at architects who design commercial buildings for the cost savings of Whitehaven on the cost of cooling. The closest ordinary Colorbond white to Colorbond Coolmax Whitehaven seems to be Colorbond Dover White. I’d be interested for your thoughts on all this Samantha, when living in the Wet Tropics — which is a very different environment to the dry Tropics of Townsville. What an educational blog, so happy to have come across it and enjoyed reading all the many which ‘white’ challenges and really appreciate that you take the time to reply and share your wealth of knowledge! We are currently building our first 2 storey home, in a coastal town with NE aspect. The windspray colorbond roof has just gone on with windspray gutters and fascia. We are rendering the ground floor level; colour still not chosen for render or garage doors thinking render a grey and pillars darker colour to break it up. Any suggestions welcome! Cladding will be used on 2nd storey, all windows clear anodised mix of louvres and fixed. We are currently agonising over the colour of eaves and cladding, definitely don’t want to throw any cream so after cooler white. Husband likes quarter or half Lexicon for both eaves and cladding. My concern is this too bright or white for NE aspect, show too much dirt and does it throw blue which may bring blue tone out from the windspray? As this is not what we want. Also, should eaves and cladding be same or different colours? Clearly we are overthinking the whole process but such a big decision and for our first home we are total novices but want it to look great too! Just reading through all your comments with great interest. Just painting our new seperate weatherboard garage and now the new house roof has been finished our colour is extremely bright and hard to look at in the sun so would love some help with a different colour suggestion. Our weatherboard house and garage has shale grey roof and gutter and on the garage we did dulux half terrace white and full strength terrace white on the weatherboards. Windows are mid Sheen white aluminium. Our house is federation style but want a modern colour. It does have 2.4mt verandah around all but one room bit think at different times of the day they will still see some sun. Any ideas would be appreciated. Thanks so much in advance for any suggestions. Hi Samantha, thank you so much for this article. I’m hoping you might give me some advice! 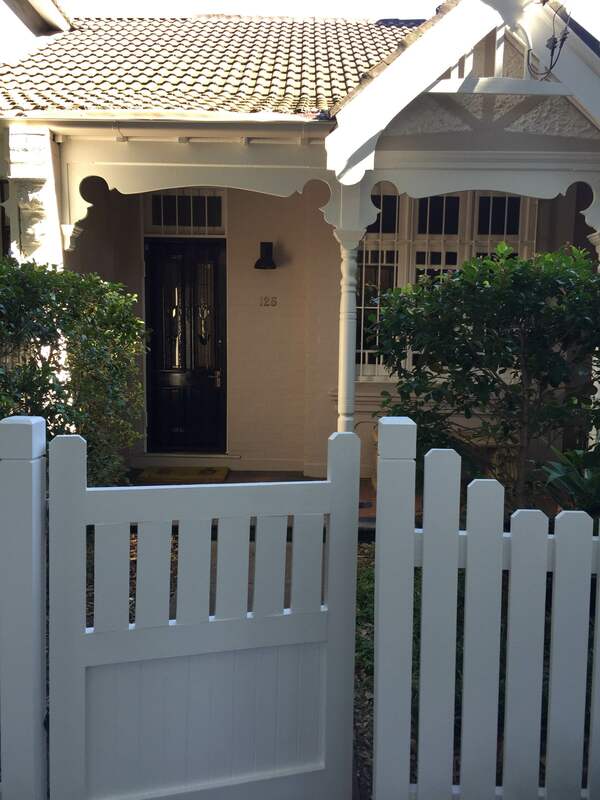 We are renovating and painting the exterior of our 1910s Queenslander cottage in Brisbane. The roof is Colorbond Manor Red, which I don’t love, but is not in the budget to change. I want a white house and would actually love to paint the whole house in Vivid White, but have been warned that might be too white and also I do like the idea of using Vivid White to make the windows and other features POP! We have also chosen Monument for the window hoods and hand rails. So I’m wondering what shade of white you would recommend? I prefer the lightest colours and also those with more grey tones – but is this a mistake with our red roof, and will they just blend in with the Vivid White trims? I tried the Resene Black White and quite liked it, and also the Wattyl Alabaster, although found it too dark. I have asked my partner to bring home some more sample pots – Dulux Natural White (even though it has a creamy tone) and Dulux Terrace White in half strength (because I’m too scared of going too dark). If you have any thoughts or wisdom I would love to hear from you! Thank you so much. I look forward to checking out the rest of your website. South facing,inner city Melbourne modern house. We are looking at snowy mountain 1/2 for our interior, is this white ok for rooms with little direct sunlight? Also door trims/skirting boards should I pick these out in a brighter white like vivid? Externally we are looking at Domino or night sky for the ground level with white on the upper story. The front facade is North facing, I read your post about green undertone, does that still work when matching with black/almost black external colour? Just don’t know which white to choose? I live on the Sunshine Coast and am revamping my 20YO rendered home. We have some paint left from a job my partner was doing on a construction site that is Lexicon Half. I feel this may be too light. What are your thoughts please? My thoughts were to do the gutters, fascias and garage door in Dune to break the lightness, but now you have pointed out the tones I can see that this will clash. We have another 15L of Mason Grey that may be better for these areas??? Now I am worried that the roof will look out of place……. You are so incredibly helpful. Have you counted how many people you have helped through your website?! And could you add me to that growing list please? We’re painting the exterior of our house in Terrace White and thinking of a shale grey roof and white eaves. We live right beside the lake and the house has been formed by combining 2 old boat sheds to make a perfect little house. I would like a soft, coastal feel and can’t decide on the trim colour/s including gutters and fascia. There are a lot of windows in the house and the old ones have previously been painted mission brown while the new ones we’ve put in are white. Any suggestions would be really, really appreciated. Thank you so much for all the advice you’ve already provided via your blogs. Hi Samantha, I am so confused with colours and have changed a few times already. Building near the beach a two story home. Eaves are surfmist house is a combination of cladding which is in shale grey and and render around the garage door and the a strip across the bottom of the house so the cladding has somewhere to finish other than the ground of that makes sense. We originally had windspray on all the Render, however it looked like a dark band around the bottom of the house. So we changed it to double strength shale grey. The garage is surmise. The house just looks dull. Nothing pops!!!! Considering doing a darker grey around the garage on the render and changing the rendered band around the bottom of the house but don’t know what colour. Front door is white and the front posts will also be white. It is very interesting reading your helpful tips. We are in the middle of a renovation of a timber home. We will have a mixture of new aluminium windows and existing timber Windows so are thinking of surfmist so they will all match. For the weather boards we are wondering about dune. The boards are rough so catch a lot of dust. We want a dark colour for the garage door. Would you match it to the spouting, which is to be replaced? What dark colour would you suggest to go with surfmist and dune? We already have a large collection of sample pots so would value some advice. We are building a home in WA and I am after a white on white or light grey and white colour scheme. We are having a Shale Grey roof and gutters and were thinking snow season half for the render and lexicon half for the windows and other trim. Having read your comments above I am now wondering whether Terrace White for the render would be a better option? Or do you have any other suggestions for colour schemes that will work with the shale grey roof? Thank you in advance for any help you can give – we are totally confused! I love your blog so much! It’s amazing. So, after testing Powered Rock on our Edwardian style weatherboard. Hubby and I have actually agreed that a white on white scheme would be beautiful. Our house faces direct south and also has a big tree’s that shade much of the front facade. We have a tired old corrugated iron roof that’s most probably original but can’t afford to paint it or change it. Our gutters are cottage green. We have lots of pretty federation glass in the windows at the front. I am looking at painting the weatherboard s in Dulux White Duck 1/4 and doing all the timber work and trims in 1/4 White Duck 1/4. What do you think of this scheme, considering the south aspect? My fear of using Lexicon 1/4 for trims, which I have also tossed up, is that it will make the White Duck 1/4 look dirty. The other scheme that my husband is keen on is just painting the whole house in one white, maybe in different finishes. Which could look either amazing or flat. Hello. I’m stuck on picking a colour. My townhouse is a peach orange brick colour on the bottom and weatherboard in top. I’m painting the garage door and front white fence monument grey and on top story was thinking Haymes Minimalist 2 or 3. Or Polar 1 I think. I can go with Dulux doesn’t matter. No body Corp here so I don’t have to match the guys at back but better not go crazy. So I thought because or peach bricks maybe a warmer creamy tone? Not sure :). Painter coming Monday and in twenty mins ha and I’ll see what he says too. White would be nice or a warmer colour. 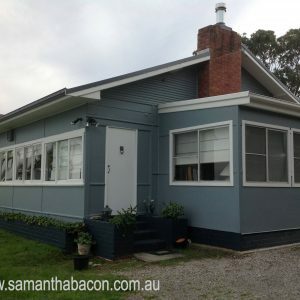 We’ve got a Californian bungalow facing west and are thinking of a warm grey for weatherboards and white windows trim. We have an iron roof in Windswept (not very visible). We’d like to paint roof facia in ironstone for some contrast. Thinking of either Dulux taupe white or Dieskau for boards, dune for brick work base of verandah and base boards, natural white for windows. Would love to know your thoughts. Thank for your blog to help all those with problems choosing grey! I’m in the middle of a Reno at the moment which consists of a west facing weatherboard home and a north facing brick granny flat. The look I’m trying to go for is Hampton’s and I’ve already made the decision to go with surfmist for the colourbond roof, gutter and fascia and a flat white for the powder coated aluminium windows. The only thing I’m having trouble deciding on is a colour for the exterior and under the eaves etc. My heart is set on white but not sure what would work with the different sun aspects, different materials (weatherboard and brick) as well as the chosen roof etc. The other option I thought of would be a grey such as Milton moon or tranquil retreat. Internally I’ve picked a matte white kitchen for house and a soft grey for the granny flat. The floors or a medium oak in both with touches of grey. I would also appreciate any guidance in terms of what white to go inside and whether to paint all the ceilings and trim the same or to go a different shade. You have nearly answered my question in all your fantastic replies above! But would just like to confirm!! 🙂 I am looking for a white exterior and same trim colour for a modern corrugated iron guest quarters. Thinking- Snowy Mountains or Casper White or Lexicon? ?Full strength or Half?? for the walls. Have you heard of a colour called Dulux Kings Canyon Grey? We are looking at painting our 20 year only Georgian townhouse in this colour, but can’t find anything about it. We are also loving Dulux Linseed, Dulux Time Capsule or Dulux Tapestry Beige. Our roof is black tiles and our aluminum windows and garage door are a classic cream which looks a bit white now. Thank you for your reply and love reading your blog. I have a north facing house so i should go darker, but i am worried the washout classic cream garage will standout if it is too dark. Hi Carmela yes the garage door will stand out more – you can arrange to have this spray painted a darker colour if it is throwing the rest of your scheme or go just a touch lighter to balance it. Thank you so much for taking the time to help us novices!! I’ve just spent hours reading through your wonderful blog and all the comments and your responses to help me decide. I’m hoping you could help me as I’ve been thinking about external colours for months and months and I’m so confused! I’m building a modern Hamptons style double story home in Melbourne with scyon cladding up top and rendered Hebel downstairs. We are a corner block and the facade faces south-west and the “other facade” (which is used as our backyard) faces north-west. We will have either a basalt or monument colourbond roof and gutters. Likely smurfmist fascia and garage door (restricted by colourbond colours and this is the closest white I could get). The aluminium window frames are pearl white and we also have timber window trims which I’ve tried to match to the aluminium frames so went with Dulux white on white. I don’t really want to change the aluminium windows to smurfmist because my interior will be Scandinavian design with lots of whites and timber and I think smurfmist windows will look too cream amongst all the internal white. I really would like a light grey home with contrast windows and thought silkwort walls (cladding and render) would work nicely. But then the fascia and garage throws me off as I think they may look too cream against the silkwort? Thoughts? The other option for walls was timeless grey but worried this is too dark especially on the south side of the south-west facing facade? Would very much appreciate your advice, ideally I would’ve liked to keep it simple and do monument roof, gutter, downpipes; lexicon half fascias, waves, windows and trims; and silkwort render and cladding. These colourbond colours for the fascia and garage really throw me off! thank you ever so much for your reply! I didn’t even receive a notification that you had replied and stumbled on this again by chance because I am researching again colours. We ended up with Silkwort cladding and render, lexicon window trims with pearl white aluminium frames, dover white garage door, surfmist fascia, monument gutter and roof. As you said, surfmist for small panels such as fascia was ok, the surfmist on a garage door really threw me off, so we went with powder coated dover white. hope that is ok. the issue now for us is the Monument roof and heat!! Actually, one last question if I may, would you think Basalt roof and gutters or Monument roof and gutters would suit Silkwort better? We are to about to embark on our retirement project of renovating an old farmhouse with a cottage green colour bond roof. We would like to paint the exterior white – could you please suggest some white combos for walls, trims etc. that would go nicely with the green roof. Hi Samantha. Building a new house in Qld & looking at creating the Modern Barn look very similar to Bonnie’s house from the Three Birds. Looking at using Surfmist Roof, Gutters & Fascia. Looking at using Snowy Mountains half or full strength on weatherboards, Austral Bricks in La Paloma in Castellana which is white solid colour. My windows will be black. Would these colours work well ? We are changing the roof of our twenty-something brick project home to Surfmist (to improve thermal efficiency. We will also be changing the garage doors and aluminium window frames to Surfmist for the same reason. The house bricks are a medium brown with off-white mortar. We won’t be rendering, so we’re stuck trying to tie the new white roof in with the brown bricks. We are unsure of what colour scheme to go with for the gutters, facias, eaves and other trims (downpipes etc). A consultant has suggested Colorbond Basalt as a contrast. Do you have any other suggestions? Would you recommend keeping both gutters and facias in Surfmist to match the roof? Or if using Basalt or another contrast colour, would you go with light gutter / contrast facia or the other way around? I live in a two story rendered townhouse and I want to paint it white. It has a black tiled roof and black railings & black garage door with lots of greenery. Can you help me with choosing the perfect white as I’m very confused with all the different whites available. Thankyou so much for taking the time to reply. I will let you know how I go with the Dulux Casper White. It’s a white that I hadn’t looked at but looks about the tone I was after. Off to Bunnings tomorrow for a sample pot. We are wanting to paint our weather board house which is currently a yellowy/mustard color to an off white. The windows are White Birch and fascias and posts are Woodland Grey. Thinking of Dulux White Duck but that might be too white. Any suggestions? Firstly thank you for your willingness to answer so many questions on this forum with such friendly and thoughtful responses. We are trying to decide an external colour scheme for our new build. It is a single storey house with quite a narrow frontage only 6m. It will have a single garage on one side which is set back from the porch on the other side. As the frontage is narrow we were thinking it may be best to keep the colour scheme of the facade light and neutral but without looking washed out. We have been thinking along the lines of Colorbond Basault roof, Surfmist garage door, Aluminium Ultra Silver windows, Dulux Ghosting Half or Dulux Feather Soft or Dulux Grey Pebble render (front facade), Dulux Ancient Ruin render (porch piers), timber front door and timber look horizontal lining above the porch piers. The frontage is North facing so it will receive full sun all year (Australia). Another option we have considered is a timber look garage door but we were concerned that it may overpower such a narrow frontage. What are your thoughts on these colour combinations and do you have any other suggestions that come to mind even if completely different than what has been mentioned above? Your input is most appreciated. Thank you for sharing your wonderful advice. We are renovating a Victorian villa. It has sandstone walls and painted brick quoins and window surrounds. The roof is unpainted corrugated iron and there is bull nose verandah with quite ornate lace and verandah poles. The rear extension will be very contemporary with rendered brick walls with black steel doors. The woodwork is currently painted cream and the quoins and masonry a darker yellow brown. We want to create a fresh, modern look and are thinking of using a soft white with grey gutters and charcoal front door. We do not want to use a yellow based white as we feel this will look quite old fashioned. We have tried various whites and are leaning towards Caspar White, White Exchange Half and Whisper White but are not sure which will look best with the yellow/orange tones of the sandstone. We are not sure if Caspar White is too grey and White Exchange Half and Whisper White too stark against the stone. Your suggestions of an appropriate colour for the painted brickwork, masonry, gutters, lace and woodwork would be much appreciated. Thank you. Ann. We are building a cottage style home that faces north east. We have chosen windspray for our roof colour and are now trying to choose the right white for the weather boards and trims. I am hoping to achieve a very very clean and fresh white house. I would be happy to use the same white for both boards and trims. What do you suggest? The brick/block colour we have chosen for our new build is austral Porcelain. We are tossing up between Surfmist or Dulux White satin powder coated finish. We are after an overall White House look. The surfmist possibly blends better on exterior in most lights.. we also have a surfmist roof and fascia, although you can only see the fascia. Not sure it’s a great match beside the porcelain though? The white satin is nice but I’m concerned the windows may make the porcelain look grey? Plus being white aluminium I’m concerned they may be too much of a feature, bright and look a bit cheap maybe? Possibly even clash with the fascia in certain light. I love a neutral soft and slightly warmer interior so this may prove difficult with the interior clashing with windows. I do hope you can help, I’ll be very grateful for any advice you can offer. We ended up going with surfmist in the end. I decided that I would rather the windows blend and not be a feature as such, had they been too white. Thank you for your reply. You’re very clever at what you do and I’m sure you’re also very appreciated by many indecisive/ amateur builders such as myself. Great read and responses, which I’ve gone through to make sure I’m not doubling up. We have a single level house, wrap around verandah with no rail. Was red brick but we’ve peeled off and put up vertical cladding. Many are saying go shale grey, though i feel it is overdone in our neighbour hood and would be expected. I had a white house look in mind, though when Ive tried 2 whites they have come out yellow-y and as you mention the Surf mist is essentially grey/white throwing what I thought would be a great white off. Do you think a Terrace white would work? I adore the picture, named Woy Woy house in your original post, with the adjoining house that looks like it’s in Basalt… We have a Granny flat which is Basalt with surf mist roof on same property, though I wanted the house to go with it, not match it…. Look forward to any feedback..
We are in the process of building a new home and im really lost as to what white to paint the exterior weatherboards and for the roof. Our design has a skillion roof we are either going to go surfmist or windspray on the roof and we have timber door for the entry and then we are thinking of painting the boards white and planting a number of plants around the house to soften it. I am worried that it is going to look cold so am hoping to choose a warm white. Not sure if you still check this thread but thought I would try my luck anyway!! We are building a new two storey house in Sydney (front of the house faces east) and I am trying to decide on a good white exterior paint colour that will go with the Colorbond Ironstone roof and garage? It is quite a large house with wide front so I don’t want anything too stark but I also don’t want it looking too yellow or creamy. We were thinking maybe something like Surfmist but not 100% sure, so I wondered what you elsemight suggest or if we went with Surfmist, what colour should we choose for the trims etc?